In an earlier post, ive described our itinerary for our trip. This time, I go into detail with the bike and gear used. I always believe that there are many ways to build your bike depending on your riding style, budget and preferences of components. I believe that getting something that is mid priced will be more economically valuable in the long run. While this may be my first time to try Ms. Jones on a tour, it didn’t disappoint. In terms of adequacy in dealing with variations in terrain, the 1×10 setup proves to be satisfactory as it can speed up in flats and provides good performance in climbs. 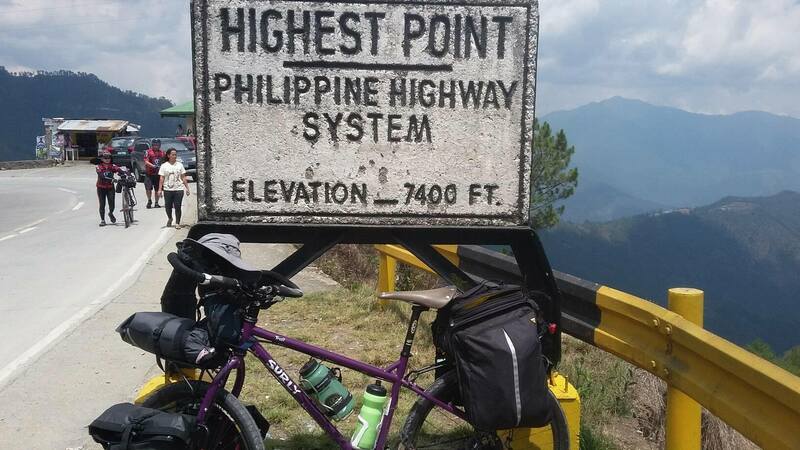 Though the Marinduque loop has its fair share of stretches of gradual elevation (as per strava, the total elevation gain is around 2600m), the setup appears to be quite responsive and didn’t wear me down during climbs. In this build, there are two things that I found concerning though. My steerer tube is a bit high due to the differences in setup…it’s much lower when I have it setup as a CX bike and quite high whenever it’s on SS or Hybrid. And in terms of handling, the cockpit tends to be twitchy. Second, is that when dealing with dirt roads or potholes, the slender frame and thin fork of the Crosscheck may not be too adequate in dealing with road vibrations. Nonetheless, these are some minor shortcomings im fine with given that the tour has been a short one. Ive heard many positive reviews about this handlebar and true enough, it is a versatile piece. As a curved handlebar, it simulates a relaxed arm/hand position and given that the bars allow you to use several hand positions (for climbs, aero like posture and touring), I can say that the Jones loop is a great handlebar if you intend to do extended tours in varying terrain. While the recent trend in oval chain rings have been mixed, I found this as a really good piece if you like a 1x setup. Though I had one instance of chain drop (too much downshifting! ), the oval chain rings shines as it lessens if not eliminates pedaling deadspots during climbs. I got this piece a few days before the trip and I can say that this may be the best seatpost rack in the market. As it addresses most problems of bikepacking saddlebags available in the market such as swaying/sagging, waterproofing, saddle compatibility and possibility of tire rub. Paired with the Revelate Designs Terrapin Drybag, My clothing remained dry and cargo stable. Though some may find the bindle rack as a piece of added weight, the difference appears to be minimal. Elsewhere, ive seen riders use this as a handlebar bag and during my short commutes, ive used this as such whenever I have the jones loop attached to the bike. There are two positive things ive experienced in using this one. Much like the framebag, this allows easy access to your stuff as you don’t need to remove the bag just to get your stuff. Also, since I felt twitching due to the high steerer tube, attaching the bag helps in stabilizing your steering which made descents and climbs more secure.